Manufacture aluminium kitchenware and houseware with brand Jawa®, Colan® and Mazaya®. Manufacture product with brand Maslon® and Maslon Grill®. Stormking Division of Logam Jawa® has a specialization in metalware product. Addresses at Sruni Village, Gedangan, Sidoarjo. Aluminium III Division manufacture product with brand Alcor® and Mikado®. Find the nearest outlets from your place to get our newest product or you can buy online. Glass Lidded Non-stick Maslon Fryer from MASPION used for frying potatoes, chicken, and other deep fried food. Made from high-quality iron steel material, strong and durable. Equipped with non-stick coating, easier to clean. Knob and handle made from phenolic, will not deliver heat and will not melt easily. High-quality, strong glass lid. Scratch-free, easier to monitor the food inside. The strainer made from iron wire coated with nickel chrome, food safe, even when it directly touches the hot oil. Made from high quality carbon steel. With non-stick coating that makes cooking and cleaning easy. Use wooden or nylon spatula ONLY. Metal spatula will make the layer peel off. 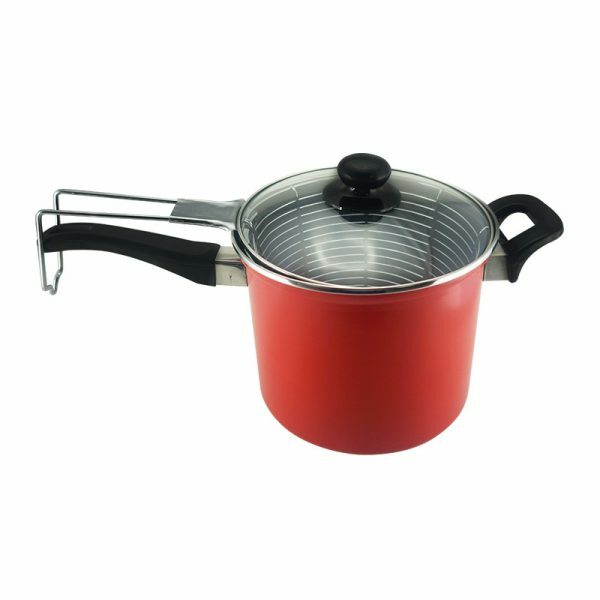 Ergonomic and strong handles make it easy to lift the pan. Before being used for the first time, cleanse the cookware with warm water and let dry. Use wooden or nylon spatula ONLY. Spatulas made of metal will make the nonstick coating layer peel off. Even though coated with the nonstick coating, better use a little bit oil or butter while cooking. After cooking, let the cookware cool down. Wash in the warm water with soap. Gently rub the stain with a sponge. Rinse and wipe with soft fabric. MAKE SURE the cookware is dried completely before stored. Do NOT soak in water for too long and avoid collisions with hard objects. Not recommended to wash using a dishwasher. For long-term care, it is recommended to cover the cookware with a layer of vegetable oil before storing. Put a little bit of oil on the tissue and wipe it evenly on the cookware's surface. © Copyright Logam Jawa ® 2019. All Rights Reserved.